Power Paws are available in 8 "regular" sizes (XXSmall to XXXLarge) and fit dogs from 6-7 pounds all the way up to about 230-250 pounds. Power Paws Greyhound Edition for "hare-footed" breeds (two center digits being longer than the inside and outside toes and a lack of arching in the toes resulting in the feet appearing longer) are available in 4 sizes. Power Paws can help your dog in so many ways! 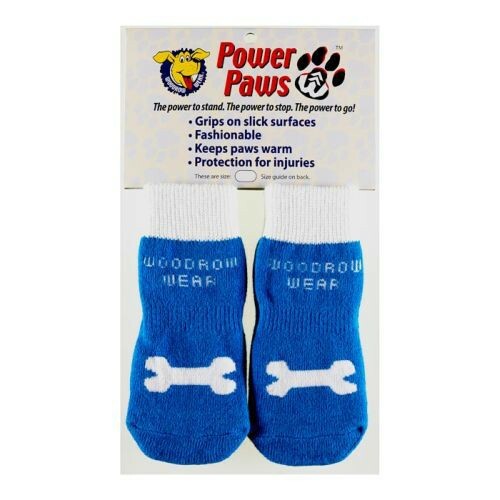 They protect paws from heat, snow (spray socks with Scotchgard or other waterproofing spray), or allergens. They also help keep paw wounds clean while providing air flow for healing. The advanced products have a reinforced toe which has proven very beneficial to dogs who have long nails, or neurological issues that may cause them to drag a foot. The sizing guide is the best way to give estimates and averages by weight, by breed, and by foot print. Unfortunately, some breeds don't follow the guide, and some have 2 regular paws and 2 hare-footed paws, and some dogs are far from "average", but in general the sizing guide will be very accurate for the majority of paws. Our size guides are based on averages. Many people upon receiving the sock think they need to be the size of the foot to fit, and they forget that they are dealing with socks that need to stretch to stay on. A good fit is snug. You can put a finger in the sock. It will stay in place while playing, walking, climbing stairs. The sock is too small if with your fingers inside to stretch the sock, you can't put it on your dog's foot no matter how much you stretch it. The sock is too large if it flops, falls off, sags.